Social networks are great for following your friends' daily musings, but rarely do they help grow your income to the point you can actually stop pretending to give a crap. 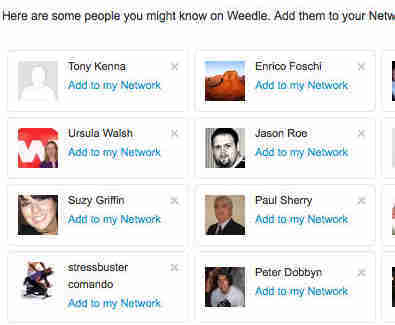 Leveraging social networks to get you up on your employment, Weedle. Like a LinkedIn/Yellow Pages hybrid, Weedle's a new platform outta Ireland helping users effectively market their professional expertise to those in need of it by exploiting mutual contacts, thereby leveraging an implicit "element of trust" that will prove misplaced in anyone mercury-al. 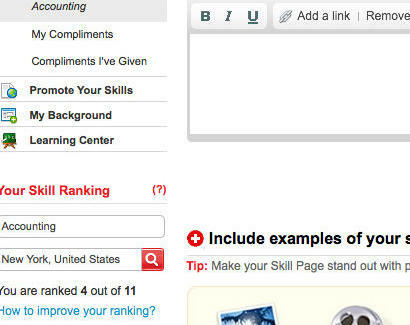 Users fill out a descrip of their vocation (plumber, intellectual property lawyer) and location, back it up with a mini resume and optional deets like a photo/video of their "skills in action", then import contacts from myriad accounts including Gmail, LinkedIn, and AOL, because somebody out there knows your grandma. Users searching for hires (done by skill set) will have their results prioritized based on individuals with whom they share contacts, allowing them to vet you by a trusted source should they choose; if interested, they can reach out and furnish you with a job descrip and proposed compensation, which generally needs to be greater for those with tiny (benefits) packages. Once the process is over, both parties can go back and choose to "compliment" one another and/or comment on the experience, though if you ever gave a crap about what other people thought, maybe you wouldn't need to be looking for a job in the first place.